Classic Italian dishes with a contemporary flair have made Trattoria No.10 a Chicago favorite since 1989 and one of the highest rated Italian restaurants in Chicago on TripAdvisor. The subdued elegance of the interior, with arched walkways, murals and original art, provides an intimate atmosphere that is perfect for pre-theatre dining. Unique homemade ravioli like the popular butternut and acorn squash with a sweet walnut butter sauce, as well as the house-made spicy sausage with arrabiata sauce have remained favorites on the menu for over 25 years. Trattoria No.10 takes great pride in supporting small, independent, local sustainable farms and adhering to the sustainability requirements described by the Monterey Bay Aquarium Seafood Watch. All major credit cards accepted. Wheelchair Accessible. Private rooms are available; for private dining inquiries, call 312.984.0098. Valet service is available on Monroe Street. Lockwood Restaurant & Bar’s rotating, seasonally fresh menu plates high taste quality from scratch with the help of local farmers and an in-house rooftop garden + apiary, rounded out with perfectly prepared trademark cocktails. Located on the lobby level of the historic Palmer House, a Hilton Hotel, we invite you to elevate your theater experience with chef inspired menus, extensive wine lists and 6 hour theatre parking validation with dinner purchase. Mercat a la planxa is a modern interpretation of timeless Catalan traditions. Located on Michigan Avenue, Mercat offers an authentic dining experience that combines fresh meats and produce with the energetic spirit of a Barcelona market. Complementing the rich cultural experience is an extensive, yet finely curated selection of cava, sangria, wine, and cocktail creations. Mercat a la planxa combines the best of both the old and new worlds, bringing a Catalan aesthetic to the heart of Chicago. Hours: Sunday-Thursday 11AM-9:30PM; Friday-Saturday 11AM-10:30PM. Park Grill is Chicago’s award-winning destination restaurant, at the gateway to Millennium Park and along Chicago’s world-class Michigan Avenue. Park Grill’s cuisine and seasonal year-round entertainment make it an experience unlike any other in Chicago, or the country. Our Executive Chef brings a chef’s interpretation to contemporary American cuisine, infusing it with unique Chicago flavor. When you sit down at the restaurant, the outdoor alfresco dining, or the café, you can start a conversation, start a meal, start a business deal, or start a celebration. We hope your experience with Millennium Park starts here. Serving up one “L” of a Burger! 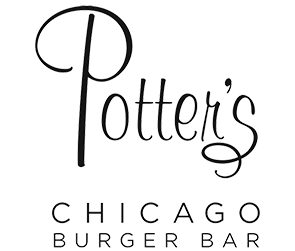 We’re named after the Palmer House founder Potter Palmer and our menu showcases burgers topped with a flavor profile indicative of its Chicago neighborhood. Venture from burger to burger, neighborhood to neighborhood, and discover the gooey cheese-curd madness of the #8 Lakeview burger, or indulgent foie gras and shaved a5 Kobe beef on the splurge-worthy #6 Gold Coast burger, served on a “gold” bun. The #2 Little Italy piles Italian beef, giardiniera, sport peppers, provolone, and au jus – a match made in burger heaven. Gather a group of friends together, settle into one of our leather sofas, and enjoy an evening of great conversation over boozy shakes and seasonal cocktails at our downtown hideaway. Owner and Chef Klara Muchnik and her son, Vadim Muchnik, opened Russian Tea Time in 1993. Centrally located in the heart of Chicago’s Downtown, Russian Tea Time has earned the distinction of being one of Chicago’s culinary “landmarks.” Russian Tea Time offers a variety of dishes from the diverse regions of the former Soviet Union Republics. Guests can indulge in an extensive assortment of vegetarian dishes – Tashkent Carrot Salad, Eggplant Orientale, Beet Cavier, and Golubtsy (cabbage rolls) to name a few. Some of the signature dishes include Pelmini (meat dumplings), Borscht (Ukranian soup), Russian Blinis (think Russian pancakes), Wild Game, Cavier, and many more. Experience our Afternoon Tea Service, offered Friday-Sunday from 2:30-4:30PM. Indulge in Russian Tea Time’s homemade, delicious, and savory desserts and house blended tea. Set in a newly constructed modern space in the lobby of 70 W. Madison, Stock + Ledger is perfect for pre-theatre, grabbing a casual lunch with co-workers, enjoying our bustling happy hour, celebrating a special occasion in one of our three private event areas, or enjoying dinner with the family. We believe in long term benefits of good food. We invest time sourcing quality ingredients that are sustainable, locally farmed, hormone and antibiotic free proteins. Don’t forget to present your Auditorium Theatre ticket on the day of the performance to get 20% off your bill! Valet available for both lunch and dinner. Validated parking in the 55 Monroe St. parking garage located across the street. tesori is also right off the Adams/Wabash CTA brown line stop. *Please note tesori will be opening at 11:30AM on December 1, December 8, December 15, and December 22. Step into a contemporary Italian experience with tesori trattoria & bar, only a short walk away from the Auditorium Theatre and right down the steps of the Art Institute. With a focus on seasonal, fresh ingredients, the chef-driven menu features small plate antipasti, hand-tossed pizza, house-made pasta, and modern classics influenced by Italy’s various regional styles. Lounge in the adjoining bar over handcrafted cocktails, a curated selection of local craft beer, and an extensive Italian-driven wine list. tesori’s three open event spaces, including an enclosed Urban Garden and private event space, also provide the perfect background for your event. Sopraffina’s private dining room has a charming and relaxed style that is intimate and casual, yet elegant without the feeling of formality. Buffet, family style, and cocktail party menus are available for private parties up to 200 guests. Please contact Elisa Harmon at 312.984.0098 or [email protected] for more information. North America’s most established hotel, the Palmer House Hilton first opened its doors in 1871 and has remained the place to “see and be seen” in downtown Chicago. When you come to our hotel, you don’t just stay here, you live here – even if it’s only for a night. Today, having undergone a $215+ million renovation, we continue evolving to serve you with the latest conveniences and comforts in meetings, accommodations and dining – a hip and historic blend of modern nuances and Chicago cultural significance. Auditorium patrons receive an exclusive 15% discount (subject to availability)! For additional hotel options around the Auditorium Theatre, go to HotelsCombined.com. For information on things to do around the Auditorium Theatre during your visit to Chicago, visit Choose Chicago and the Chicago Loop Alliance.